Port Moresby is the capital of Papua New Guinea (PNG) and the largest city of South Pacific. The city has an annual population growth of over 2% with a total population of around 300,000. It is the business center of the country as well as the main port. 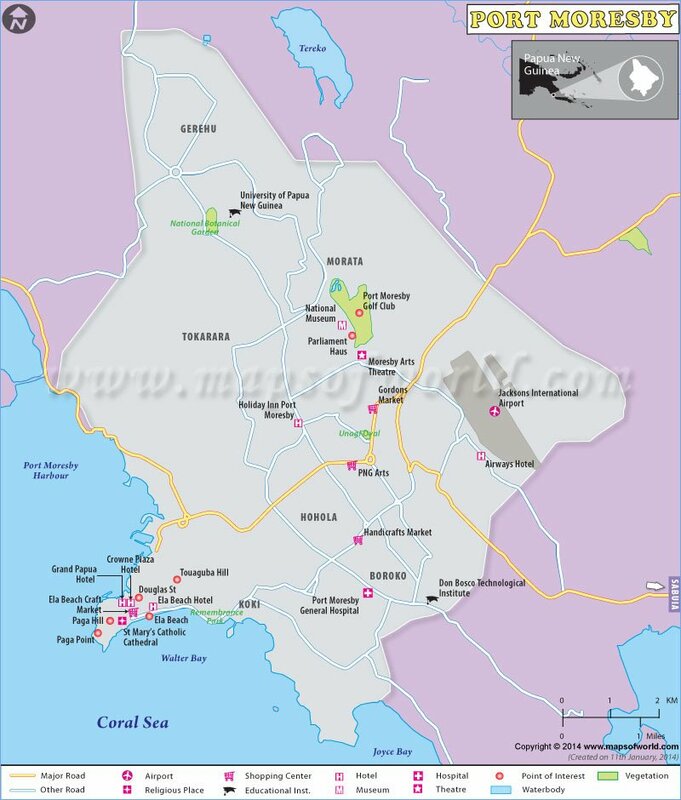 Port Moresby acts as the National Capital District and is also the capital of the Central Province, which surrounds the city but not a part of the province. The city had been occupied by Motu and Koitabu people even before it was founded by Captain John Moresby in 1873. Almost a decade later, the British added it to their colonial empire and it later became a base for the Allied forces during World War II due to its strategic location. 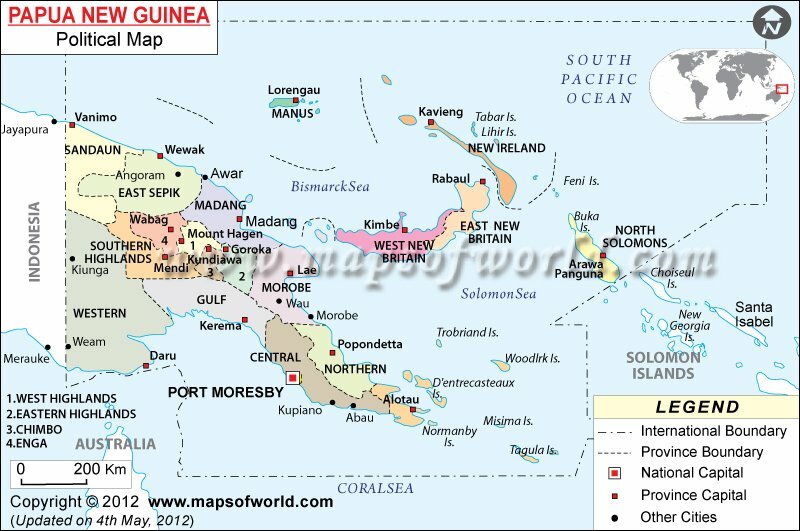 It became the capital of Papua New Guinea after the country’s independence in 1975. The languages spoken here are English, Motu, and Tok Pisin. Located on the shores of the Gulf of Papua, Port Moresby lies on the south-eastern coast of the Papuan Peninsula. It is pretty spread out with the port being the original settlement which includes the business and banking districts. The Owen Stanley Range surrounds the city which shields it from the heavy rains affecting the rest of the country. It is built around the largest harbor of Papua New Guinea, Fairfax Harbor. Sogeri Plateau lies 46 kilometers to its northeast. The Yule Island lies to the west of the city along the Hiritano Highway which also leads to Bereina. Jacksons International Airport connects Port Moresby to places like Singapore, Sydney, Brisbane and Hong Kong. It is served by Air Niugini, Qantas, etc. Port Moresby is accessible via road only from the city of Kerema. Not many passenger boats are available from the city although one can avail smaller boats found on the north of the wharf to go to the Gulf. Walking around the city can prove to be a little difficult and it is advisable to have a motorized vehicle at ready use. One can hail taxis, rent a car and even push bikes. Public Motor Vehicles (PVMs) are cheap and can be found all around the city, although they are mostly over-crowded with locals. Port Moresby features a typical tropical climate with a wet and a dry season with relatively constant temperatures. The wet season is from December to May; when the weather is humid and hot. The best time to visit is the dry season which is from June to November. With the weather relatively dry and cool, it is the ideal time for tourists. Hiri Moale Festival is celebrated in mid-September and marks the beginning of Hiri trading pilgrimage. Celebrations include sea voyages which are undertaken by the locals in 100 traditional Lakatoi canoes, which start from the Ela Beach, in the memory of the sea voyages undertaken their Motuan ancestors. The Ela Murray International School holds an Ela Beach Craft Market Run on the last Saturday of each month which exhibits local artifacts, like hand woven baskets and other souvenirs from all over Papua New Guinea. Port Moresby is an excellent place for snorkeling and scuba diving. It is also rich in historical artifacts and wildlife. Port Moresby Nature Park, situated next to University of Papua New Guinea has beautiful lush tropical gardens and is abundant in wildlife. One can spot cassowaries, tree kangaroos, numerous wallaby species, and many other native bird species around what was previously known as the National Botanical Gardens. Owen Stanley Range, a 4000 meter high narrow coastal strip which forms the northern border of Port Moresby. Touaguba Hill houses the ambassadorial residences and offers a picturesque view of the city and the ocean from the top. Sogeri Plateau, located near the Varirata National Park covers an area of over 1000 hectares and is the beginning of the Kokoda Trail. The Papua New Guinea National Museum and Art Gallery, divided into three premises, houses over 7000 contemporary art collections, 20,000 war relics, 25,000 archaeological collections, 18,000 of natural sciences and over 30,000 anthropological exhibits. The main museum is at Waigani, which has five displays; the J.K McCarthy Museum in Goroka has six and the Modern History premises in Gordons have two display rooms and a library. Other attractions include Bomana War Cemetery, Moitaka Wildlife Sanctuary, Ela Beach, Sepik River, Laloki River, etc. Hotels in Port Moresby are generally expensive. Airways Hotel is considered to be one of the best and facilities include apartments for people who’d like to stay longer. It also has an amazing view along with an Indonesian Spa. Hotels like Grand Papua and Crowne Plaza are located in the center of the city and offer a lot of luxurious facilities. Loloata Island Resort is located away from the city on the beach equipped with secluded sandy beaches.